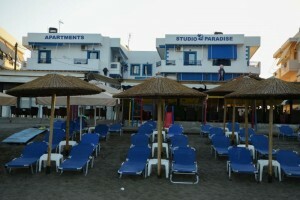 With 8 new apartments of two rooms each and 12 new studios that comfortably accommodate each one up 3 people Studio Paradise will satisfy your needs. More specifically, there are 3 apartments with two rooms for in total 3 people, 4 apartments with two rooms for up to 4 to 5 people. We have a friendly apartment adapted for people with mobility problems and 12 studios that comfortably accommodates each of them up to 3 people. All rooms at the accommodation are spacious, tastefully decorated and furnished with modern style. Most of the rooms have their own balcony with wonderful sea views. All feature their own bathroom (shower / WC, hair dryer), kitchen with electric stove, coffee maker, cooking utensils to prepare your meals if you wish, and individually controlled air conditioning. They are ideal for families with children. Child beds are available. In each room you have access to the wireless internet (Free Wi-Fi). If you have a laptop or other mobile device, you can use them in the bar area where you also have Wi-Fi. The rooms and studios are very clean. Daily cleaning by our maids and linen such as towels and sheets are changed every third day. On the ground floor you will find a laundry room if you want to use it. Just down from our accommodation you will discover the large and sandy beach with umbrellas and sun beds which we provide free for our clients. If you do not want to prepare meals yourself, you can take your breakfast (not included), drink, refreshment, or any other drink you want or enjoy a snack in our coffee shop. Here you can relax and unwind while gazing at the deep blue sea or admiring the sunset.